The Midland GXT760 rechargeable walkie talkie may not be the newest Midland walkie talkie model on the market, but it definitely deserves a mention. The GXT760 has built a name for itself for being extremely reliable, working in circumstances where many other walkie talkies cannot be counted on. The walkie talkie is very lightweight and can easily be carried around. It’s one of the smaller models, and with it’s antenna that you can screw off, it could easily fit into a small pocket in your bag, or you can use a clip to attach it to your belt. It’s size and weight make this basic walkie talkie suitable for activities like hiking, camping and even climbing. The GXT760 is water resistant against light water exposure, meaning it will be able to withstand most weather conditions, although it may not be very suitable for any water based activities. It does feature a very clear backlit LCD display, which shows a wide array of information like channel information, battery life, and reception. 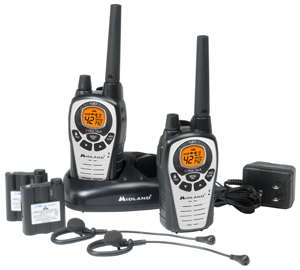 When you buy this product, you get included two midland GXT760 radios, 2 earpiece headsets, and belt clips. You also get a docking station to charge the two devices at the same time, additional battery packs and adapter cables. The quality of the headset included was fairly good, but since the GXT760 has a standard headphone jack, you could connect any regular earphone or even speaker set to the radio. The advertised transmission range of the Midland GXT760 is up to 36 miles. Like any walkie talkie, this can only occur under perfect circumstances. Obstructions like buildings, trees and hills all have an effect on the actual range experienced. In a heavy woodland, or urban areas the experienced transmission range is typically around 2 miles. This means that this rechargeable walkie talkie set performs as well as most newest models coming out right now. The GXT760 supports 42 channels including 22 GMRS channels, and 20 extra private channels. The walkie talkie has access to NOAA weather channels, which will give notice of the most severe weather alerts in your region. You can use the weather radio scan which will automatically scan every weather channel and stop on any channel that is active so you will never miss anything important. You will always be ahead of the game 24/7. There are 142 privacy codes available, giving a total of a vast 4133 channel options. This immense amount of channel options means you should never have a problem finding an empty channel for your party to operate in. Other conversations will be automatically filtered out, so you will have no disturbances. These privacy codes are a great feature to have when you’re in an area where there might be a lot of competing traffic. 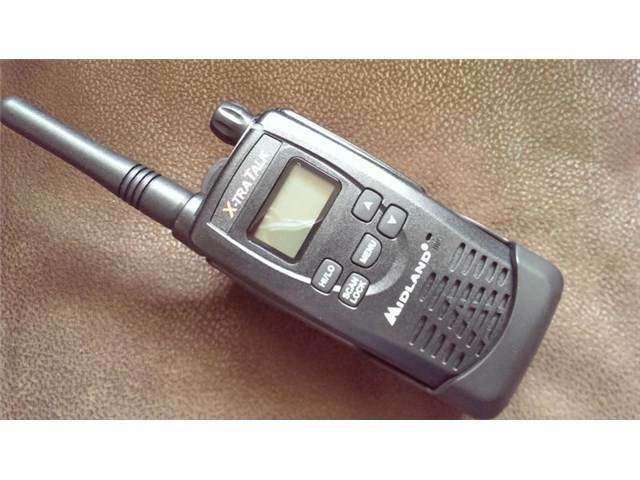 The Midland GXT760 rechargeable walkie talkie has 10 call alerts to choose from. You can individually set these call alerts to walkie talkies in your group, so they could help you identify who it is that’s trying to contact you. The device also has a roger beep, giving off a clear beep at the end of transmission when you release the PTT button, so everyone else knows when the channel is clear to speak again after use. Another simple but clever feature is the silent mode. With this activated you will be notified of incoming alerts with vibrations rather than intrusive sounds. This means the unit can be taken fishing or hunting without upsetting your concentration, or in fact upsetting the environment around you. As mentioned previously, the GXT760 has a number of headphone jacks. The headphone jacks are compatible with AVP1 all the way till AVPH5 headsets. An additional great feature for this is eVox, which is a voice activated transmission feature, meaning you can leave your walkie talkie on your belt or in your bag and use the headset without ever needing it. eVox has 5 levels of voice detection, preventing you from having to use an external microphone when speaking with a soft voice. On the other end of the spectrum, it can also pick up whispers if used in the most sensitive setting. The keypad locks will lock your keypad to make sure you don’t accidentally transmit when the walkie talkie is in your bag or on your belt. You can also customize the keypad lock and set a code on it, to prevent children or strangers from using it. The Midland GXT760 offers several charging options including dual pocket desktop charger, NiMH rechargeable battery back, and DC vehicle adapter. The walkie talkie radio can also run on 4 alkaline batteries. 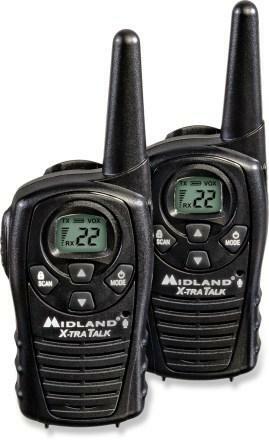 Overall, Midland GXT760 is a great rechargeable walkie talkie that offers good value for your money. It’s transmission range is very large, and the quality of features provided is great. There is a good reason this walkie talkie is still among the favorites of many enthusiasts and that is because, while it may be an older model, it was built to last and with the future in mind. The sound quality is very good and it’s size, weight and general usability mean that it deserves it’s spot in our top 5. Hi, I'm Jamie and I'm the creator of Walkie Talkie Reviews.net. I am an outdoors enthusiast with many hobbies like hiking, boating and climbing. I have been using walkie talkies on my trips and have set out on a journey of finding out which radios suit your needs best. Walkie Talkie Reviews Copyright © 2019.